Dinner prep around our house has always been a family affair. From the time the children were pretty small (4 or 5-years-old) I've consistently given them age appropriate jobs in the kitchen to help get dinner on the table. See below for some job ideas. Now that my kids are older (the ones at home are 9, 12, 14, and 17), I have a house full of competent cooks who are happy to help in the kitchen. Of course, not every child helps with every meal, but on any given night if you peeked into our kitchen you'd see a collaborative effort of me and children willingly doing their part to help prepare for dinner (cleaning up, on the other hand, is worthy of a whole different blogpost). You might see one child standing at the garbage peeling vegetables, another whipping together the ingredients for a sauce, and one of the older kids standing at the cutting board chopping ingredients. They don't often stay in the kitchen the whole time dinner is being prepared, but even if all they have time for is a few minutes of helping, my workload is still reduced and they take pride in the fact that they've done their part and contributed in some way to the meal. It's honestly often one of my favorite times of the day. Lately, though, I've realized that a lot of people are intimidated by sharing the kitchen with their children. Even my 17-year-old daughter's friends, whose moms are excellent cooks, have very limited experience in the kitchen. When talking to my friends as to why this is, I hear a variety of excuses about how their kitchen isn't big enough, or that their kids liked to help when they were small, but not anymore, or just that they just don't like the mess the kids make. I'm here to say that it's worth the mess and worth the crowdedness, to let them in. The benefits of not just tolerating their presence, but welcoming them in and utilizing their help to help create family meals, is incalculably beneficial to you and to your children. There will be messes. There will frustrating moments when they make a preventable error. There will be times when you bump into each other. But that's how children learn and the benefits of having them there go far beyond just helping them to become better cooks. It's bonding time with mom (or dad) and time when they learn how to positively contribute to the dynamics of the family. Confidence--Kids are bombarded on so many sides with things that they can't do and often shoved into a corner with an electronic device when their presence is inconvenient; so I say welcome them in instead. Let them help you! Make them your partners and give them opportunities to legitimately help getting a meal ready. Over time as their skills and contributions increase, their confidence will grow as well. Skills for the future--boys and girls stand a lot to gain from knowing their way around the kitchen. If they are taught well when they are young, they will have a better foundation on which to develop healthy habits and gain the ability to cook for themselves and their future families when they leave home. Health--when they have practice and familiarity with making food from scratch, they are less likely to turn to processed foods when given the choice. They recognize the superior taste and nutrition of homemade meals, and you can also use the time in the kitchen together to talk with them about the cost benefits as well. Helping you--When you give them jobs that actually contribute to the preparation of the meal, you will lessen your own workload. Young children require a lot of supervision, but if they learn those skills at your side when they're young, they can lend a much larger, more independent role when they're older. Cooperation--what better way to learn how to work with others than under the direct supervision of a parent doing something that has to be done anyway? Start small, no matter their age. Just ask them to do one thing that will legitimately make your life a little easier (even if it's just opening a couple of cans or stirring the pot for 5 minutes), and thank them profusely for their help. Make sure they are well-instructed and supervised, not only for safety reasons, but to build a cooperative spirit and to help reduce their frustration level if something goes wrong. This is not time for you watch tv or jump in the shower, but a time to work side-by-side with them. Make their jobs real, actual jobs that benefit you and legitimately help in the meal prep. The kids will know that if they are not actually contributing to the meal and it will negate the benefits to you and to them if you are just making up easy jobs for them to keep them out of your hair. Be consistent. If you only ask them to help when you're making a specific dish or when they're not busy, they won't get in the habit of helping. Even on a crazy night when kids have lots of homework, they can chip in for a few minutes. A little brain break never hurt anyone, and besides, the faster dinner gets on the table the happier everyone is! Express gratitude to ALL those that help---At the dinner table make sure you thank each person individually for the part they played in preparing that meal. My kids eat this gratitude up and love to tell daddy (or guests) the part they played in making the meal. Never criticize a child who didn't help, but make sure that even a person who just opened a can gets thanked. Don't make a big deal about or get angry if they burn something, or add an incorrect ingredient, or in some way make a preventable error. Simply explain how it could be prevented in the future and go with it. You might have to start something over, or put up with an overcooked portion of the meal, but if you get negative with them you will make them more hesitant to help in the future. Compliment what they did right and move past it! Allow their contributions to grow in importance as they grow older and gain skills. If you still have your 10-year-old stirring pots (and baking the occasional batch of cookies) for you, then you are not utilizing their potential. Give them bigger jobs. Show them the recipe and let them take ownership of part of the meal. See below for more specific ideas, but a 10-year-old is definitely old enough to measure and add spices, make sauces and marinades, peel vegetables, etc. If properly trained, teens can be entirely in charge of side dishes or even make entire meals themselves. Related to the one above, don't overwhelm them either. If you haven't been having them help all along, don't expect them to jump in and be able to do things without any experience. Additionally, if they're having an off day or feeling overwhelmed already, don't force them. This should be a joyful experience and not one where mom is yelling at the kids every day to get them to help. That's why I highly encourage having them start with small, but helpful tasks on a very consistent basis (at least a few times per week), then build from there. In addition to having them help with dinner, give them opportunities to be independent in the kitchen. Let them whip up a batch of cookies by themselves (tweaking the recipe if they want). Let them make pancakes, or fry themselves an egg. Don't stand over their shoulder, but let them experiment (even if it means making something that turns out gross)! These kinds of experiences will boost their confidence, help them gain culinary creativity, and help hone their skills for helping with bigger kitchen jobs eventually. Use the summertime when your schedule is less structured to give them more responsibility in the kitchen. This is a great time to let them plan menus, take over entire meals (with you as the assistant instead of the head chef), and in general really amp up their skills. My kids aren't interested in helping. If you give them a series of small jobs on a consistent basis and let them know how much you appreciate their help, even the most reluctant helper will start to realize that they're not just performing some empty thankless task, but that they are actually contributing in a visible way to help get a meal on the table. This will not come overnight. It may take years, but if you continue having them help, in even small ways that are more palatable to them, it will make a difference. I don't have time to deal with their messes/errors. I promise that putting up with their messes now will pay for itself over and over again as they get older. Let them make the mess. Let them experiment and make errors. That's what it takes to learn and someday when they're 14 and you're not feeling well and they go and prepare an entire meal from scratch, because they feel confident in the kitchen, you will be glad for those messes they made when they were 8. My kitchen is too small. We've recently redone our kitchen, so it's not tight anymore, but up until a year-and-a-half ago our kitchen was very small too. Think outside the box. Prep work can be done at the kitchen table, the garbage can can be moved, kids can help in shifts. 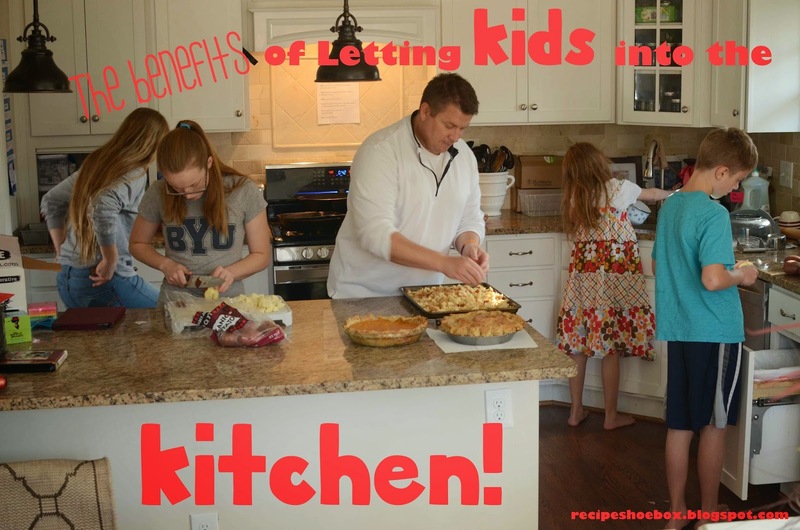 If you wait until your kitchen is "big enough", if you're like me, you could be waiting an awful long time and miss years' worth of opportunities to allow your children to learn and to gain confidence in the kitchen. My kids usually just make our normal family recipes, but for someone who's looking to be a bit more independent, a cookbook for kids can be fun. We have this one , this one , and this one that my kids have enjoyed. spreading frosting, butter, or jam over cakes, toast, etc. *close adult supervision is highly encouraged during any activity which requires the use of heat or sharp utensils. What about you? How involved are your kids in the kitchen? Do you have any other great ideas? Thank you for this post! I try to let my kids help me in the kitchen as often as possible, but sometimes my controlling tendencies get the best of me. These were great reminders of whey I NEED to let them help and that I just need to relax about the mess and some of the other minor inconveniences. Thank you! Just read a worthy article. Great advantages for the kids you know. I like recipe And want to learn soon because after 2016 i have marry. I am cooking with my boy quite often. 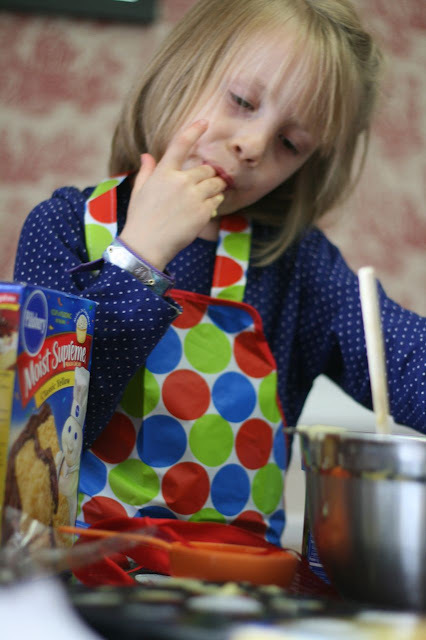 Bring them into the kitchen with you and seize the opportunity to help them develop their independence, confidence, critical thinking, and coordination!